The Lahinch team from 1963: (Back) Jack Wall, TG O’Donnell (president), Frank Lehane, Jack O’Callaghan; (Front) Brendan Vaughan, Justice JG Hurley (non playing captain) and Michael Rush. ALTHOUGH he has lived and worked in Nottingham since 1966, the love of golf Michael Rush picked up in his native Lahinch has had a profound effect on his life. 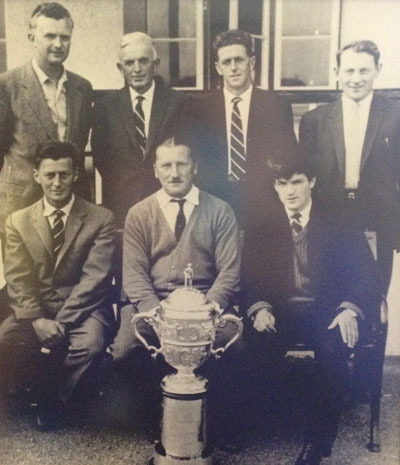 Now almost 72, Michael or ‘Smiley’, which he says he is better known as, was the centre of attention at Lahinch Golf Club earlier this month when the exploits of the 1963 All-Ireland Junior Cup winning team were recalled at a golden anniversary celebration. Lahinch Golf Club won the same competition in 1961 but according to Michael, the cupboard has been bare since. “I wasn’t even in Clare in 1961, I was in London. My brother, Tommy, was part of the 1961 squad. He was a radio officer and he won a vital game but he had to go back to sea and he missed the last two rounds. When we had won it twice, you think, ‘this is easy enough’. You could think different now. Lahinch hasn’t won any All-Ireland of any sort since, ladies or anything,” Michael told The Clare Champion. The then 21-year-old was part of a five-man team 50 years ago. Lahinch beat Rosses Point in the semi-final and Queen’s University, Belfast in the final, which was played in Sligo. His teammates were Brendan Vaughan and Frank Lehane, Lahinch; Jack Wall from Ennistymon (all RIP) and Jack O’Callaghan, Cork. “He [O’Callaghan] was a creamery manager in Ennistymon. We can’t find anything out about Jack but I’d say he’d be 90 years of age now. When I was 21, he must have been 35,” Michael calculated. 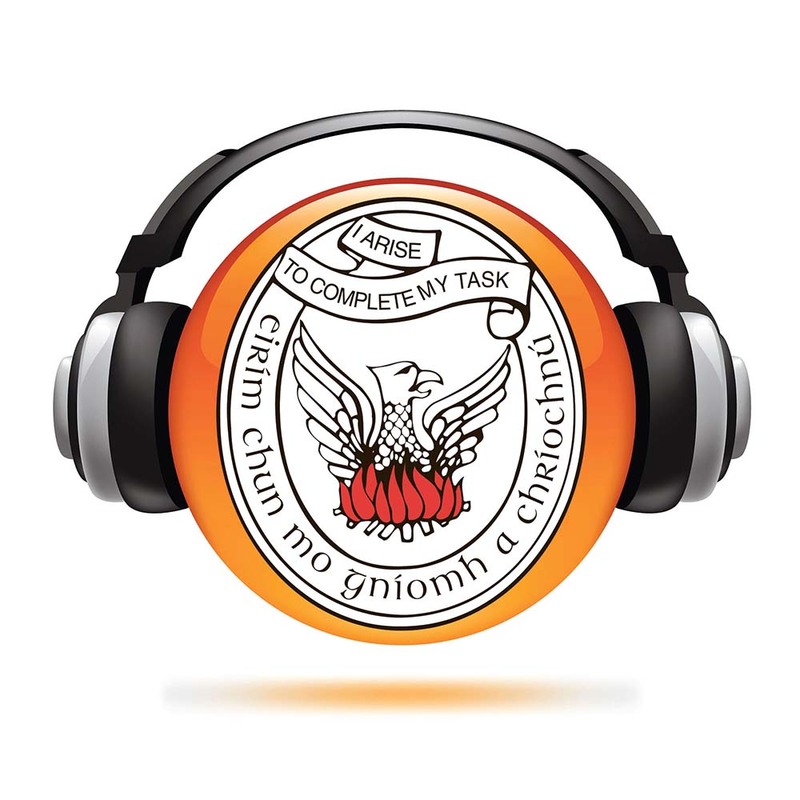 Michael worked in the family bakery and shop before emigrating in 1959, having completed his Leaving Certificate. He returned for a few years in the early 1960s but emigrated permanently in 1966. “I had passed the Leaving but there was nothing here. All the lads that I knew all went to London,” he said of his first experience as an emigrant. However, before leaving Ireland, Michael learned that he had been selected as one of the young sports stars of the year in the country. John Giles was honoured in the same year. Michael’s feat of returning a net score of 58, while a nine handicapper at a Visitors Cup competition in Lahinch, led to the prestigious award. Such was the magnitude of his achievement that Joe Carr (Walker Cup player) and Welsh Ryder Cup captain Dai Rees suggested that Michael be brought to the US as a mascot for the Ryder Cup team. “I heard that on the radio but then I said I was going to England with all of the other lads and that was the end of the golfing scene for me,” he said. Michael met his wife, Bridget, who is from Lisdoonvarna and he calls B, when he came home from London. They set off for good, however, in the mid-1960s and have five sons and a daughter, 13 grand-children and a great-grandchild. His wife’s brothers were already in Nottingham and had plenty of work that required a head for heights. “The average wage that time over there was about £15 a week but they were earning over £100 per week. I didn’t know what they were doing but I said whatever it is, I’ll give it a go. Sure enough it was dangerous, it was erecting pylons. There were a few narrow escapes but in the end I was like a monkey going up. But then I broke my ankle,” he recalled on what was an early autumn evening in Lahinch. That bit of misfortune did Michael no harm in the long term. He had to change jobs and started working with Raleigh, who employed 10,000 people at their factory in Nottingham. Michael didn’t even own a golf club at that stage but a member of the factory’s golf society got wind that he was a handy golfer and invited him for a round. Michael has a clear recollection of the day. He was immediately roped into the golf society. “They had a big golf society in the Raleigh factory of about 200 people. They got me clubs and brought me down to where they were having competitions. They gave me an eight handicap. I walked away with the competition, they pulled me two more and then I played the next one and I won that. I won every competition they had that year,” Michael laughed. Encouraged to join a local golf club in Nottingham, Michael was soon representing the county. So for a couple of years in the 1970s, Michael represented Nottingham on the golf course. He remembers an occasion when his club, Wollaton Park, hosted a seniors’ tour event, which attracted some internationally recognised golfers. 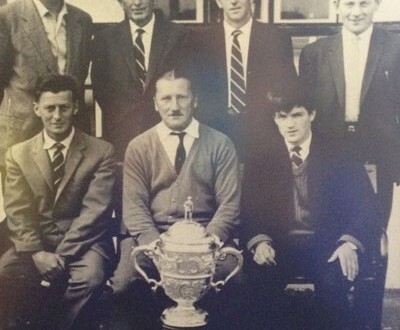 Michael would have loved to caddy for Peter Thompson but not when he heard that three Skerrets from Lahinch were also down to play in the same event. “I said ‘you’ll have to forget Peter Thompson then’. I told him that the three Skerrets were born 300 yards from me in Lahinch. I couldn’t but caddy for Paddy Skerrett. “Didn’t a reporter hear about it and put it in the paper ‘that four handicap Mickey Rush from Wolleton Park, turned down Peter Thompson’. But I’ll tell you one thing, it didn’t do me any harm. All the golf club people from around Nottingham were coming up shaking my hand, saying it was a nice thing I did,” he said, smiling at the memory. While his family has always been his main priority, Michael acknowledges that golf has been good to him. He has met and played with Henry Copper, Bruce Forsyth and comedian Stan Boardman, who even borrowed one of Michael’s jokes at a golfing event. “I said the political parties have now got jockeys and that the Conservatives have got Frank Detorri. Didn’t I tell Stan. I said ‘he can’t know that one because I made it up.’ He was up talking and he said ‘do you mind if I tell them the story?’ He told it completely different and he told it on the telly and all,” Michael revealed. Michael still plays but not competitively at Wolleton Park, which is a parkland course where he served on the committee for five years. Now retired, he plays about four times weekly. He feels he hasn’t completely lost his touch, though. “I can’t hit it as long as I used to but my actual handicap is seven. I hardly ever miss a fairway off a tee,” the diminutive Lahinch man said, that competitive glint still evident.